The Cisco Webex Room Kit brings more intelligence and usability into the smaller meeting rooms, with the unmatched video and audio experience organisations have come to expect from Cisco and VideoCentric. 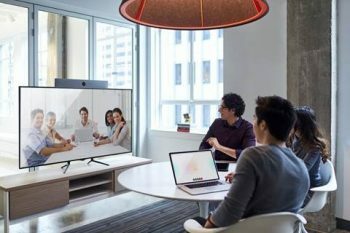 The Cisco Webex Room Kit integrates with your flat panel displays and creates a powerful collaboration solution that enables smarter meetings, smarter presentations and smarter rooms with full flexible integration for either your on-premise deployment or the Cisco Collaboration Cloud and Cisco Webex Teams. The Cisco Webex Room Kit from VideoCentric includes intelligent camera technology, high powered codec, crystal clear speakers, and excellent microphones all integrated into one single device and is the ideal solution for small rooms of up to seven people. Rich in experience and functionality but priced affordably for kitting out all your smaller meeting rooms with video collaboration tools, the new room kit can be paired with a Cisco Webex Teams platform for your desktops, mobile users and persistent collaboration, our AV room design and installation services, and for your larger rooms, integrator solutions such as the SX80 and Cisco Webex Board, for complete collaboration for everyone across your organisation. The Cisco Webex Room Kit brings intelligence to your smaller rooms, with discreet, tracking technology. The Webex Room Kit also supports dual screens for video and content, and dual content sources for your in-house meetings. See your content in 4K resolution and share it wirelessly or wired – however you prefer. The Cisco Webex Room Kit counts, analyses and monitors meeting participants and usage to enable you to better plan your resources and measure your ROI. With tight integrations with screens for enhanced functionality and in-room control for room peripherals through the Touch 10 device, your small meeting rooms can be as intelligent and integrated as your larger rooms. Get in touch today with our Cisco experts to find out more about the Cisco Webex Room Kit and Cisco Webex. You may also be interested in the new Cisco WebEx Room Kit Pro – find out more about the Room Kit Pro here.